Medicare for America has a lot of moving parts, but the relevant part for our discussion here is the one that creates a new public health plan and then lets employers forcibly switch all their employees to that plan. This is an option that the vast majority of employers are expected to exercise. Under prior analyses of this type of plan (previously called “Americare”), almost all employers switch over to the public plan because it has a much lower price. What this means is that, under Medicare for America, most people with employer-sponsored insurance will not be allowed to keep private coverage if they chose. Instead, their employer will force them on to the new Medicare plan. If they like their current insurance, they will not be able to keep it. The only difference for them between Medicare for All and Medicare for America is that they will be informed that their insurance has changed via a letter printed on company letterhead instead of a letter printed on government letterhead. That, and the fact that the financing for Medicare for America will rely on the head taxes we call premiums instead of payroll taxes, which draw more from the rich than the poor and middle. That Medicare for America will result in at least tens of millions of people on employer insurance being forced onto the new public plan is undeniable. But one response you might hear to this characterization is to say that employers can already force employees to switch plans, so this is nothing new. And that’s true of course. But what that response reveals is that the entire premise of the “forced switching” critique of Medicare for All is bankrupt. It is already the case that people can be forced off their employer-sponsored insurance either by being fired or because their boss decides they want to go with a new plan. Indeed, this happens literally all the time. In 2018, 66.1 million people separated from their job, each of them losing their health insurance if they got it through that job. In our current system, if you like your health insurance, you do not get to keep it. Your boss decides whether you get to keep it by deciding whether to retain you and by deciding each year whether to change health plans. To be clear, this is not meant to be a criticism of Medicare for America. Indeed, one could make the argument that Medicare for America is clever precisely because it takes the wildly authoritarian system we currently have — where instead of individuals choosing their health insurance, their boss chooses it for them — and leans into it in a way that gets bosses to force most people onto Medicare. But that argument requires you to recognize what is going on and so far pundits like Krugman seem to be entirely confused about this. 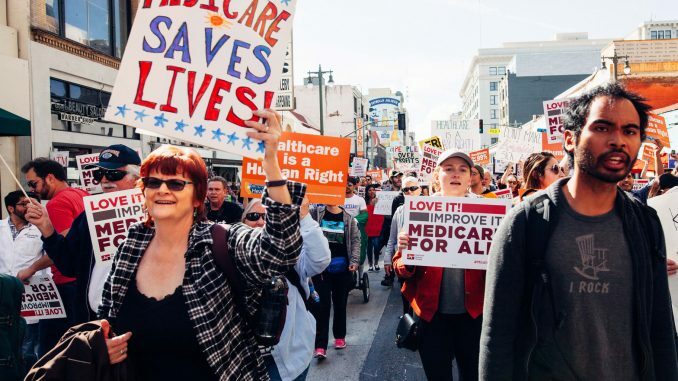 In terms of the “political argument,” I genuinely don’t understand how people can convince themselves that Medicare for America is less of a political problem than Medicare for All when both will result in huge swaths of people with employer insurance being forcibly switched onto Medicare without them having any choice in the matter. The only thing you could really say is that Medicare for America obscures what it is doing better and thus can trick the public more easily. That seems like a stretch to me, but then again, if they tricked Paul Krugman, then maybe they can trick a lot of people much dumber than him.